Classy, a San Diego company providing Web-based fundraising services for schools, nonprofits, and other social impact organizations, said Tuesday it has agreed to serve as the online partner for the Leukemia and Lymphoma Society until 2021. The society operates as a voluntary health agency dedicated to finding cures, and helping to ensure access to treatments for blood cancer patients. A spokeswoman for Classy said the company does not disclose financial terms of its customer contracts. The Leukemia and Lymphoma Society raises an estimated $75 million in annual online donations. The spokeswoman said that means the society would likely be Classy’s biggest fundraising partner once its various campaigns migrate to the Classy platform. The deal comes at an auspicious time for Classy, which has been growing rapidly and was listed in September as one of Xconomy’s 12 San Diego tech startups to watch in 2016. While Classy was founded in 2006 to raise funds for charitable causes, the company did not develop its software platform until 2011. 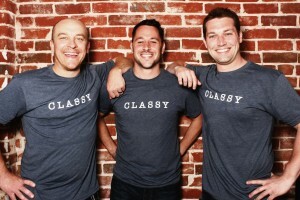 Classy said it now helps raise donations for more than 2,500 nonprofits of all sizes, including Heifer International, Oxfam America, National Geographic, Team Rubicon, FEED, and Pencils of Promise. After raising $19 million in Series B funding last summer from Peter Thiel’s Mithril Capital Management and other VC investors, Classy expanded its workforce from 50 to 150 employees. The company also increased 2015 fundraising on the Classy platform by 100 percent over the previous year. Classy’s performance was noteworthy enough to recently land the company on Fast Company’s list of the top 10 most innovative companies in social good, joining the ranks of Facebook, Warby Parker, and Indiegogo. The company said it is already set up to serve big enterprise customers like the Leukemia and Lymphoma Society, an account that includes a dedicated account manager, priority technical support, and an engineering project lead for implementation. Classy said the society’s flagship fundraising campaign, Team in Training, will be the first to move to the Classy platform. Since its inception 27 years ago, Team in Training says it has trained more than 600,000 participants in triathlons, marathons, cycling events and more, raising nearly $1 billion for blood cancer research and patient support. Over the next two years, the society also plans to move three other fundraisers to Classy: Light the Night Walk, Man and Woman of the Year, and Leukemia Cup Regatta.